A two weeks moderate strenuous trekking through the mighty Taurus range passing glistening mountain lakes. An intricate topography of lofty gorges and compact valleys make this part of the Taurus (Known as the Aladaglar) a very attractive challenge to trekkers like ourselves. The powerful “horseshoe-like” limestone massif is almost naked of trees on its high northern elevations, while on the southern flacks there are majestic slopes of pine scented forests and verdant open scrubby-land. The Bolkar range offers plenty of limestone reef and a handful fantastic panoramas and a magnificent scenery at your feet - the beautiful mountain lakes of Bolkar. 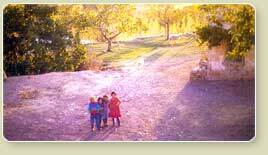 The high meadows or pastures are inhabited by semi-nomadic groups during the summer, in the months of June to September - in particular, by the yoruk, whose origins are Adana and whose traditional occupation is grazing their goats and sheep. 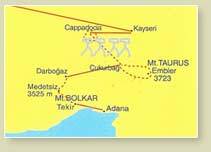 On our trek, we will often meet with the hospitality of nomads and local villagers of this area..
Meet at the airport of Adana and transfer to hotel for overnight. Drive to the trailhead village of Tekir (1600 m) where our trekking begins from. More impressive scenery as we trek through the Elmali Gorge on our way to our camp site at 2200 m. 3 hours walk through a pine forest. Dinner and overnight at camp nearby nomadic ones..
We ascend the impressive valley to the Kocagedik pass (3050 m), as we gradually climb up, the cool mountain air refreshes us. En route to Kızıltepe camp site (2800m), we pass some mountain lake with refreshing water and some grassy Alps. Overnight camp with all meals. 5 h. walking. 3 h walking on the plateau surrounded by the peaks of the highest mount of the range and we trek up to the mount Medetsiz (3524m) the highest peak of the Bolkar range. Then the trail slopes down to the Maden village (1665 m high), where the life style has not change for centuries. 9 hours trekking. Overnight camp with all meals.. Walking up in the Arpalik valley, to the Meydan plateau to join our camp site at 2300 m. Possibility to spend time around the Cini and Karagol lakes. Overnight camp with all meals. 3 h.
This day will be spared to Mount Karatepe ascension, which highest point is at 3266 m. We’ll take opportunity to spend swimming time in Karagol and Cinigol lakes with cool and fresh water. We’ll certainly have chance to contact with nomadic people pitching their tent nearby this lakes and whose main activity is grazing goats. Return to Meydan camp site for overnight with all meals. 5/6 h.
Through valleys and hills we follow the path sloping down to Darbogaz, a rather rustic settlement, at 1450 m high. Then drive to the Aladaglar range. On arrival to the Cukurbag trailhead village, we have a lunch-break in a guesthouse. Then we continue on, through a pine forest to Alaca plateau where our camp site is at 2450 m. 5 h walking. From our base camp, we make an optional walk to Mt Alaca. We trek on the Southern slops of the Taurus climbing gradually up to a pass at just under 3000 m. The walk is not too difficult, and as we ascend the cool mountain air refreshes us. Arriving at the high peak, we are rewarded with a nice panoramic view. We descend back to the Emli base camp at 1800 m, for overnight with all meals. 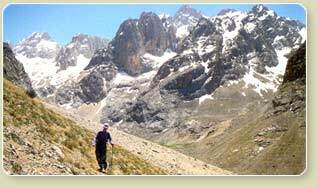 6/7 h.
We descend to Siyirmalik Valley before climbing up to the high pastures of the Eznevit Yayla (2538 m). Depending on the time of year, we may encounter the semi-nomads of this area grazing their flocks. After lunch we gradually descend to our campsite at Kayacık. About 6 hours walking. Overnight camp with meals. 2000 m.
Trekking in the east along the Yalak Deresi trail to a narrow canyon with spring water. 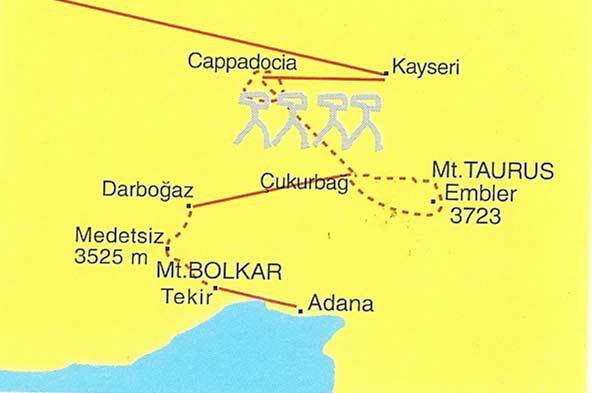 Then cross the rugged Celikbuyduran Pass (3450 m). Then it is very easy to ascend to the summit. 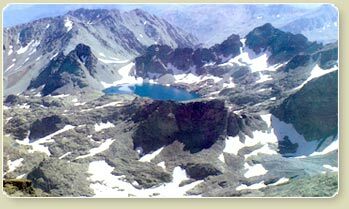 Splendid scenery and possibility to see whole Taurus range mount Bolkar and other summits, also a nice view of the Yedigoller basin (Seven lakes) though most of the lakes are still out of sight. Back to Kayacık camp site. 6 h. Overnight Kayacık camp site with all meals. More impressive scenery we see today is Cimbar and Narpuz canyon. We follow the pass on the Eastern face of the Demirkazik and go over the pass at 3300m. We go on descending to the Dipsiz lake (2900m), a magical place with wildflowers. Arrive to Demirkazik, the trail end village. 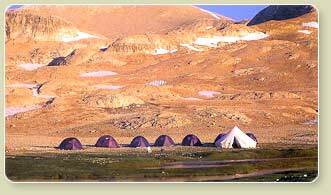 Overnight Demirkazik village camp (1550m) with all meals. 6 h walk. In the morning drive to Cappadocia. Three million years ago the violent eruptions of Mount Erciyes and Mount Hasan covered the surrounding plateau with tuff. From this brittle rock wind and rain eroded the Cappadocia spectacular of surrealist landscape. During the day we’ll discover this fantastic rock formations. Overnight in regular camping. 4h. Transfer to Kayseri airport and fly to Istanbul. Known as Constantinople until the first World War, Istanbul was the old capital of the Byzantine and Ottoman Empires. Nearly all the city's main sites of historic interest are in old Stamboul. The Blue Mosque, Topkapi Palace and the Hippodrome are ones of the most interesting monuments of the old city. The Covered Bazaar is not far a way and is well worth to visit. Overnight hotel.